At present there are three SOS Children’s Villages, one SOS Youth Facility and six SOS Social Centres in Uzbekistan. SOS Children's Villages started working in Uzbekistan in 1996. The country was undergoing economic and social change due to the recent political changes. The capital city of Tashkent was home to the first SOS Children's Villages programmes. The work of SOS Children's Villages has continued to meet the needs of local children, young people and families: we are now operating in three locations in Uzbekistan. The Republic of Uzbekistan is situated in Central Asia. It has borders with Kazakhstan in the north and the north-west, Kyrgyzstan and Tajikistan in the east, Afghanistan in the south east and Turkmenistan in the south. Uzbekistan has a population of around 28.1 million (July 2011). The majority of its inhabitants are Uzbeks, but there are also Tajik, Russian, Kazakh and Tartar minorities, amongst others. Its official language is Uzbek. Around 38 per cent of the population lives in urban areas, with the capital city of Tashkent housing around 2.2 million inhabitants. Uzbekistan became independent from the Soviet Union in 1991. Uzbekistan lost its Russian subsidies in 1991; this led to economic decline in the country. The Uzbek economy is mainly based on the production and export of cotton: it is one of the largest exporters and producers of cotton in the world. In order to farm cotton intensively, a complex irrigation plan was created – this has had negative and lasting effects on the environment. In the past decades, the large Aral Sea has declined to one tenth of its size thus affecting the lives of the people living in its proximity. With an unemployment rate of 70 per cent, many people have been forced to leave the area in order to make a living elsewhere. In addition, the high dose of pesticides and fertilizers used for cotton growing also caused soil pollution. Around half of the population of Uzbekistan works in agriculture. However, only around ten per cent of the Uzbek territory can be farmed as the rest of the country is a desert. Around a fifth of the population works in manufacturing and 35 per cent in the service sector. Although Uzbekistan has made some economic progress since it became independent in 1991, sharp income differences still exist because wealth is distributed among a small elite. The poverty rate, especially in rural communities, continues to be high – around 45 per cent of the population lives on less than 1.25 USD a day. Corruption remains a problem, and reports suggest it is getting worse rather than better. A number of international agencies have been critical of Uzbekistan's attitude to human rights. Human trafficking is a concern in the country. Girls are often taken from Uzbekistan and trafficked abroad, or sent to another area of Uzbekistan to work as domestic servants. Men are forced to work in construction or agriculture. Recently, HIV/AIDS is increasingly becoming a concern. Uzbekistan is a transit country for drug-trafficking, and as drugs have become more available, there has been an increase in intravenous drug users - especially in urban areas. Around 39 per cent of the population of Uzbekistan are children under the age of 18. The recent social and economic changes have affected the lives of young people. For example, educational reform was planned but its implementation has been slow; and unemployment is especially high among young adults leaving education. Children often drop out of school to work in markets or in agriculture. Reports suggest that many children are forced to work in the cotton industry, especially during the autumn harvest. This has caused many Western clothes producers to boycott cotton from Uzbekistan. Children who live and work on the streets are an increasing problem. Many rural children have been forced to move to urban areas in order to survive, or earn some money for their families. Most of the children who are taken into care are placed in institutions. In particular there is a culture of "institutionalization" of children with disabilities. The Uzbek government is striving to improve the conditions in such facilities. Children leaving this type of care are not prepared for independent living. The situation of girls is particularly bad as they tend to get married early, they do not continue into higher education, receive lower salaries and have more limited access to social services such as housing. 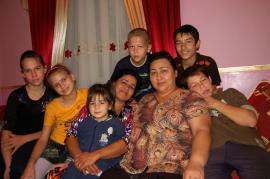 SOS Children's Villages runs a variety of programmes to support children, young people and families in Uzbekistan. These programmes include care in SOS families, day-care in the kindergarten, care and support for young people and community support in social centres. Since 2007, the family-strengthening programmes have been working with local agencies to allow children who are at risk of losing the care of their family to grow within a loving family environment. SOS ensures that children have access to essential services for their healthy development and also strengthens the support systems for vulnerable children within the community.